rehearse in San Antonio Thursday. Some of Drum Corps International's finest will be in action this Saturday, Jan. 8, coordinating, teaching and performing as part of the halftime show for the U.S. Army All-American Bowl at the San Antonio Alamodome. 125 high school seniors were selected for this year's U.S. Army All-American Marching Band (USAAAMB), a group spearheaded by the National Association for Music Education (MENC) and New Jersey-based sports marketing company All American Games. Band members chosen to take part in the All-American experience receive an all-expenses-paid trip to San Antonio. In only a matter of days, the marching ensemble learns and perfects a six-minute production for the halftime show. The football game will be broadcast Saturday on NBC at noon CT. The performance of the USAAAMB can be seen in a live webcast during halftime at AllAmericanGames.tv. Learn more about the USAAMB at MENC.org. Want to be a part of next year's U.S. Army All-American Marching Band? 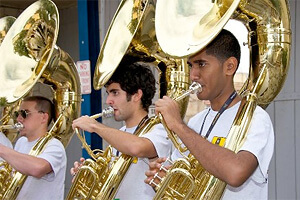 High school seniors during the 2011-2012 school year who "exhibit exceptional musicianship, marching achievement, character, and leadership," are eligible to apply for the 2012 USAAMB. A deadline for nominations that must must be completed by the student's band director is quickly approaching on Monday, Jan. 17. Visit MENC.org for additional information and the online nomination form. Photo courtesy armystrongstories.com.